More than 444,580 frames from NASA's Spitzer Space Telescope were stitched together to create this portrait of the raging star-formation occurring in the inner Milky Way. As inhabitants of a flat galactic disk, Earth and its solar system have an edge-on view of their host galaxy, like looking a glass dish from its edge. From our perspective, most of the galaxy is condensed into a blurry narrow band of light that stretches completely around the sky, also known as the galactic plane. 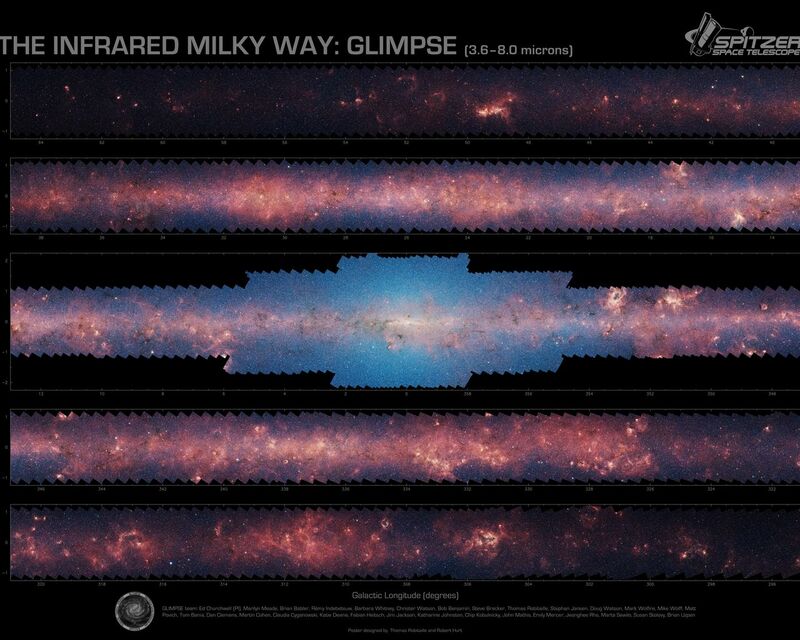 In this mosaic the galactic plane is broken up into five components: the far-left side of the plane (top image); the area just left of the galactic center (second to top); galactic center (middle); the area to the right of galactic center (second to bottom); and the far-right side of the plane (bottom). 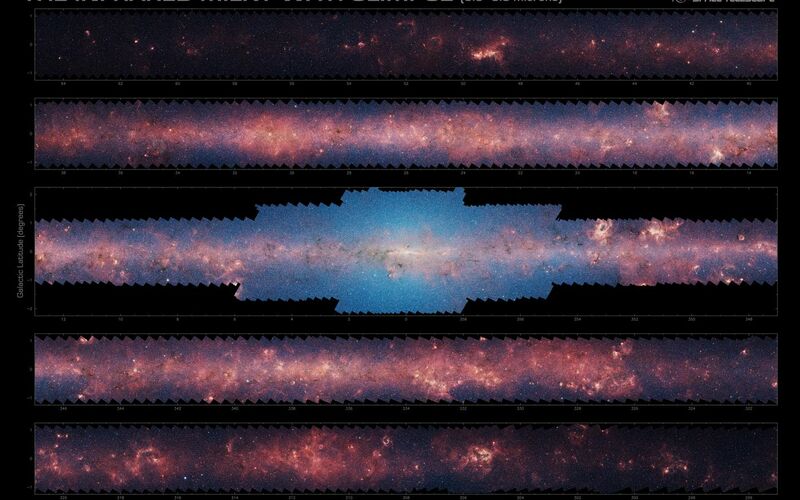 Together, these panels represent more than 50 percent of our entire Milky Way galaxy. The red haze that permeates the picture comes from organic molecules called polycyclic aromatic hydrocarbons, which are illuminated by light from massive baby stars. On Earth, these molecules are found in automobile exhaust, or charred barbeque grills—anywhere carbon molecules are burned incompletely. The patches of black are dense, obscuring dust clouds impenetrable by even Spitzer's super-sensitive infrared eyes. 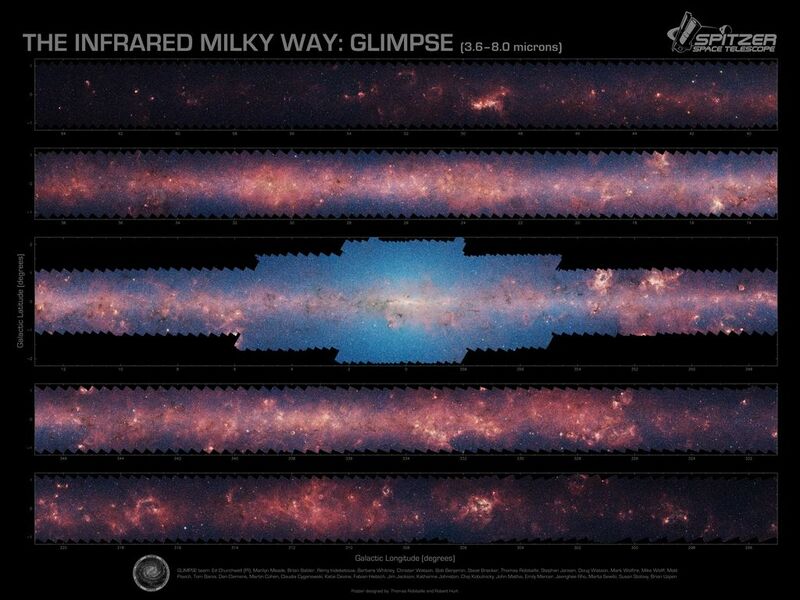 Bright arcs of white throughout the image are massive stellar incubators. The bluish-white haze that hovers heavily in the middle panel is starlight from the older stellar population towards the center of the galaxy. This picture was taken with Spitzer's infrared array camera, as part of the Galactic Legacy Infrared Mid-Plane Survey Extraordinaire (GLIMPSE) project. This is a four-color composite where blue is 3.6-micron light, green is 4.5 microns, orange is 5.8 microns and red is 8.0 microns.